Holiday entertaining is made easy with these make-ahead Chocolate Raspberry Cheesecake Parfaits. They’re dairy-free and grain-free, and have all the decadence you’d expect from a cheesecake! This post is sponsored by E.D. Smith. As always, all opinions are my own. Thanks for supporting the brands that make Crumb Top Baking possible. Christmas is just around the corner, and it’s time to consider your dessert options for the big day! While I always have cookies, bars and cakes on hand for the holidays, Christmas Day dessert requires a little something special. I love serving a decadent dessert that looks pretty and festive, and leaves dinner guests asking for seconds. I know, I have high expectations for my desserts! This year, to help meet my high exceptions, I’ve teamed up with my friends at E.D. Smith to create a recipe that will wow your guests! 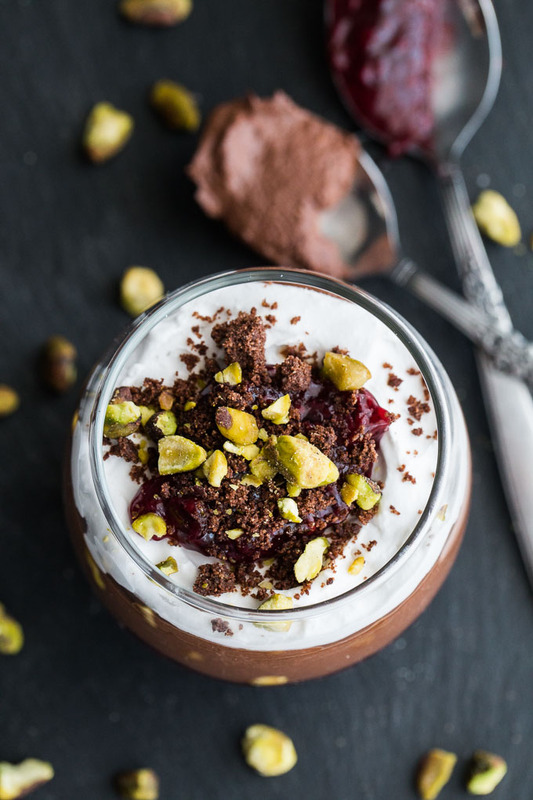 These Chocolate Raspberry Cheesecake Parfaits have an almond cocoa crumb base, with a creamy cheesecake filling made from avocados, cocoa, maple syrup and coconut milk. So they’re dairy-free and grain-free, and with a layer of E.D. 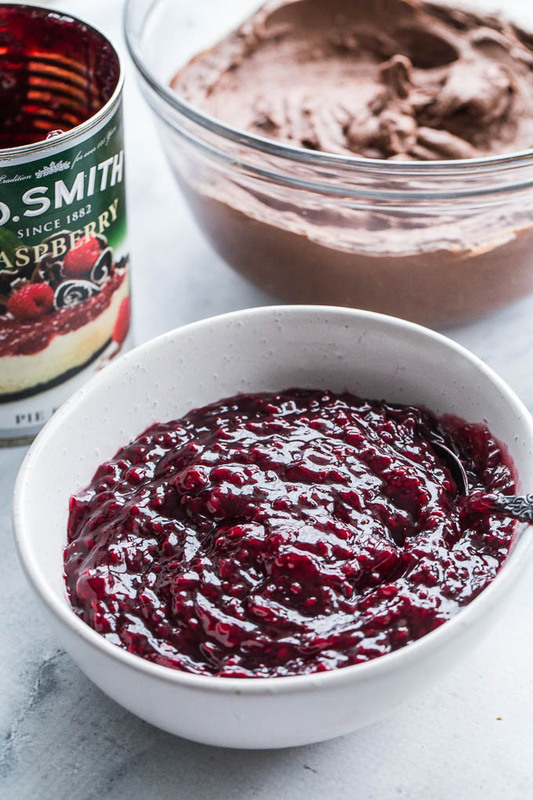 Smith ready-made raspberry pie filling, they’re an absolute show stopper. If you’ve been following Crumb Top Baking for a while, you know I’m a fan of E.D. Smith. Their pure pumpkin has been a staple in my recipes for years. From pumpkin donuts to avocado pumpkin cookies, fall baking wouldn’t be complete without pure pumpkin in the mix. And while I’ve been buying E.D. Smith products for years, it was only recently that I learned they’re the largest Canadian manufacturer of jams, jellies and marmalades (for over 135 years! ), and their real fruit pie filling is the number one brand in Canada. So with those kind of stats, I was eager to create a festive dessert with their pie fillings. And what better pie filling to use at Christmas than raspberry!? 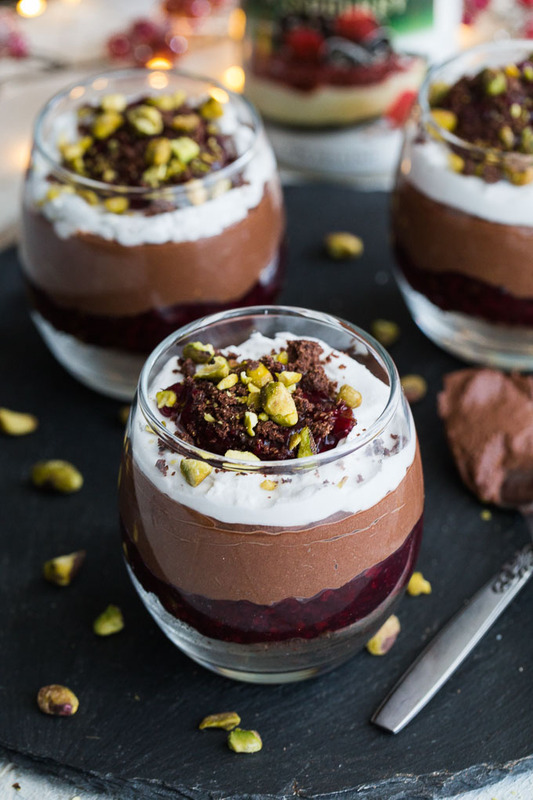 It’s bright, vibrant and festive, and it pairs beautifully with the layers of chocolate in these parfaits. And speaking of chocolate layers, can we take a moment to appreciate the thick and creamy texture that avocado, cocoa, maple syrup and coconut milk create when they’re all whipped together?! 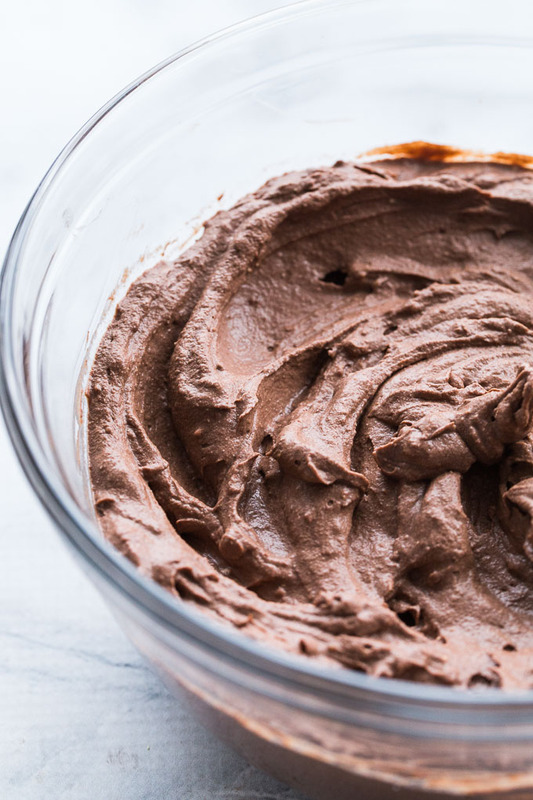 I could eat this dairy-free cheesecake filling straight out of the bowl! These parfaits should be made a few hours (or up to a day) in advance and refrigerated to allow the cheesecake layer to firm up. Just add the coconut whip and other toppings before serving. The coconut whip is just solidified coconut milk whipped up in a high-speed mixer. In order to get a whipped cream texture, you need to use full fat coconut milk that has been refrigerated for about 24 hours. This allows the milk to separate and solidify. If you’re not sure if it’s fully solidified, just place the cans in the freezer for 20 minutes or so. As for toppings, I like to reserve some almond cocoa crumbs and raspberry pie filling for the top. And crushed pistachios are always a festive touch. For an elegant dessert, serve the parfaits in stemless wine glasses. Just cover them with plastic wrap while they set up in the fridge. For a more casual theme, use glass jars with lids. This recipe makes six large parfaits or 10-12 small ones. 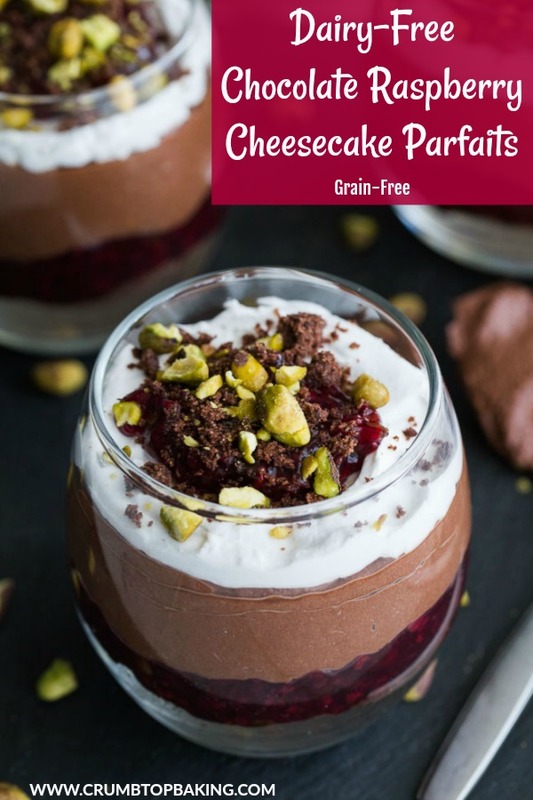 If you make these Chocolate Raspberry Cheesecake Parfaits, I would love to hear about it in the comments below. Or take a pic and share it on Instagram by tagging @crumbtopbaking. And be sure to follow #LavishlyEDS and #EverydayEDS for other amazing E.D. Smith recipes! In a small bowl, sift together the almond flour, 1/4 cup of cocoa, coconut sugar and chai spice. Add the melted coconut oil and stir until well combined. Press the mixture onto the baking sheet and bake for 8-10 minutes. Remove from oven and let cool completely before breaking into crumbly pieces. Set aside. Add the avocados and maple syrup to a large bowl and beat with an electric mixer on medium speed until combined. Gradually add the remaining 1/2 cup of cocoa, beating well after each addition. Increase to high speed, and beat the mixture until the cocoa is well incorporated and the mixture resembles a chocolate frosting. In a large mixing bowl, scoop out the solidified coconut milk from the four refrigerated cans (discard the liquid). Using an electric mixer, beat on high until the milk is whipped and creamy. This will take a few minutes. Add half of the coconut whip to the avocado chocolate mixture and stir until well combined. (You can also use the electric mixer to do this). Set aside the other half of the coconut whip for the parfait topping. Set out six 8-ounce wine glasses or glass jars and add the almond cocoa crumbs to the bottom of each glass or jar, reserving some to top the parfaits. Add a layer of raspberry pie filling to each parfait, reserving some for the topping. Next, divide the chocolate cheesecake mixture into each glass or jar, and cover and refrigerate for a few hours to allow the cheesecake to set up. When ready to serve, top with the remaining coconut whip, almond cocoa crumbs, raspberry pie filling and crushed pistachios. For the coconut whip, you will need to use full fat coconut milk that has been refrigerated for about 24 hours. This allows the milk to separate and solidify. If you’re not sure if it’s fully solidified, just place the cans in the freezer for 20 minutes or so. Thanks so much Dawn! 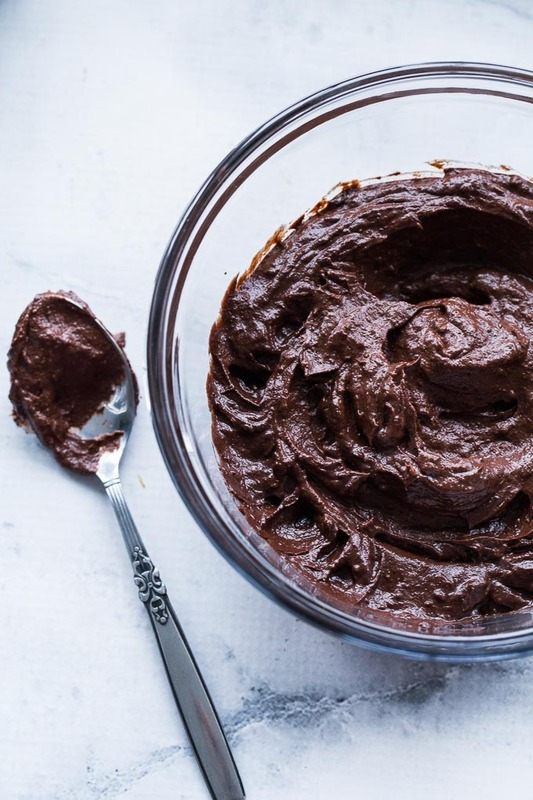 I love using avocado for a chocolate filling or frosting. It’s so creamy and you don’t even taste the avocado. Can’t wait to see your tart recipe! I love make ahead dishes for entertaining. Makes life so much easier. Absolutely agree! Thanks for stopping by Patrick! These look absolutely divine, Leanne! So creamy and rich and just perfect for Christmas! I don’t think we have E.D. Smith down here but I’m going to check because if they’ve been around so long, I know they make good stuff! Have a great week! Thanks Kelsie! I hope you can find some E.D. Smith in your neck of the woods. They have been a staple in grocery stores around here for as long as I can remember! These look fantastic Leanne!! Especially that pudding layer! I could eat that by the spoonful for sure! Thanks Lisa! I was definitely eating it by the spoonful, straight out of the bowl! If these are the kinds of desserts you serve dinner guests, I want an invite! Haha, all jokes aside these look absolutely beautiful and delicious! And it was interesting to know E.D. Smith has been around that long! I use their pumpkin purée often to and had no clue. Saving this link onto my phone so that I can make these next time I have people over for dinner!!! Thank you Vanessa! You’re welcome for dinner any time! I don’t always make these types of decadent treats, but the holiday season calls for a little something special! Would love to know what you think if you make these! Well this looks delicious!! A perfect dessert – so luxurious! Pinned! Thank you Annie! And I appreciate you pinning. Enjoy the rest of your week! Thanks Jo! You’re too sweet! I would love to know what you and your guests think if you make them! Decadent and healthy…what a great combination. Everything look so good! These look amazing! Would be perfect for a Xmas gathering. And as always, the pictures look incredible. Thanks Terry! I’m definitely planning to make these over the holidays! All there ingredients allows one to enjoy the treats this time of the year without the guilt. Thanks. I’m glad you like the ingredients! Hope you get a chance to make them! These just look so creamy and chocolate and delicious. Love that raspberry layer too to cut through all the richness. Thanks Marie! The raspberry definitely pairs nicely with the chocolate crumbs and ‘cheesecake’ filling! I love how easy these are for holiday entertaining Leanne! And the flavor combination is perfect. I’m a huge fan of chocolate raspberry. And I can never pass up cheesecake. Thanks Mary Ann! I love raspberry and chocolate together too. And I’m big on make ahead desserts for the holidays. Makes life easier! Thanks Sabrina! So glad you like the combo. And gotta love make ahead holiday desserts! Make ahead desserts are the best and especially during a super busy season. These look absolutely beautiful and delicious Leanne. It is such a rich and delicious combo of flavours. Thank you for a great recipe, this I would love to try. I totally agree Ashika! Make ahead desserts are so great this time of year! Hope you get a chance to make this one! Dairy free for the win! These parfaits look so scrumptious!! Perfect for Christmas. 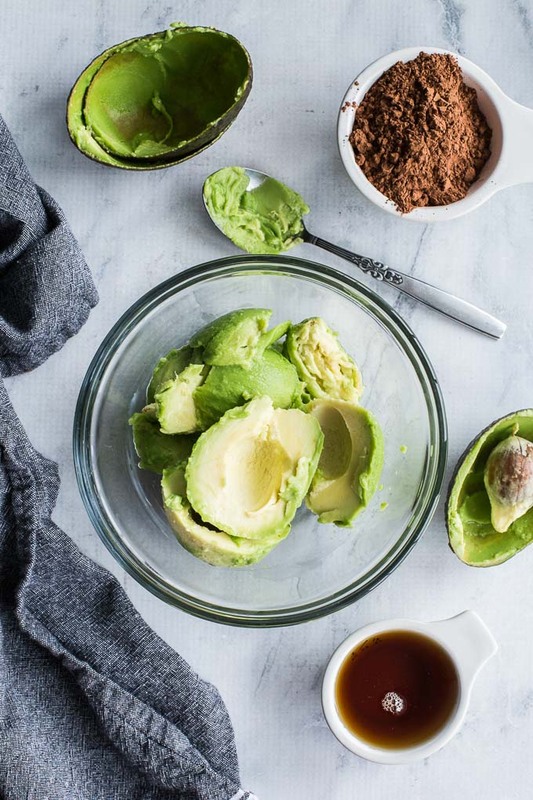 I love the use of avocado to make these too….so genius! Thanks Kelly! Gotta love the versatility of avocados! They’re perfect for dairy-free desserts! These are so elegant, Leanne! I love that you can make them dairy-free. Coconut whip is so good! 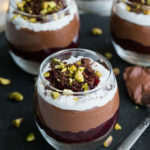 I have never tried the raspberry pie filling, but I will definitely have to pick up a can so I can make these parfaits!! Cheers! Thanks Katherine! The raspberry pie filling works well with the chocolate crumb base and the chocolate avocado filling! Definitely worth a try! I hope you get a chance to make these! These look absolutely luscious, Leanne! Who would guess from looking at these beautiful treats that they’re healthful AND delicious! Thanks Marissa! 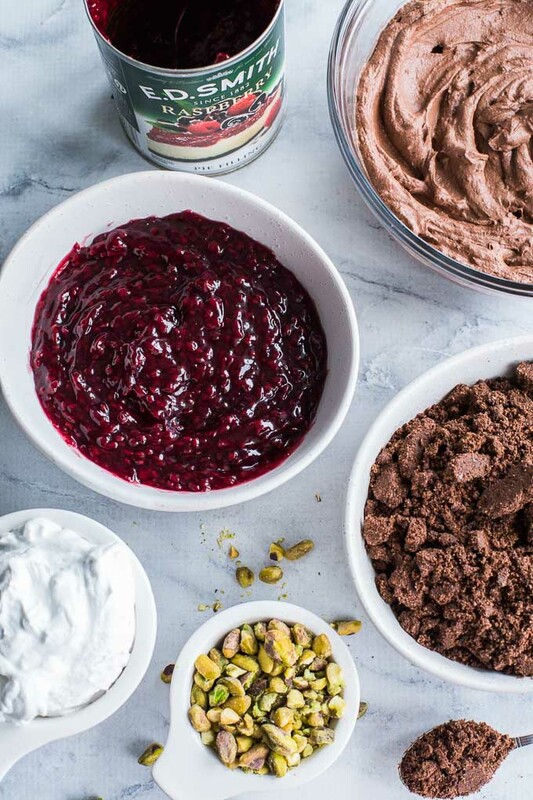 I love trying to incorporate some clean eating ingredients into my desserts, and I was delighted that these worked out as both a dairy-free and grain-free dessert! Chocolate and raspberry combinations are my favourite! Thank you for this dairy free, grain free cheesecake heaven in a cup dessert, Leanne. I will definitely try it during the season for all of us, which family members who have dairy and grain restrictions. It looks wonderful!! Thanks so much Denise! I’m so glad it’s a dessert recipe your family members can enjoy! Be sure to let me know what you think if you make it! Congrats on your first sponsored post, Leanne. I love everything about this delectable dessert, especially that it’s dairy & grain free so that everyone can be included in the deliciousness. It’s a show stopper and perfect for Christmas dinner dessert. Can’t wait to try! Thanks so much Colleen! Appreciate it! I hope you get a chance to make it. I’ll definitely be making it again as my contribution to Christmas Day dinner! You’ve done it again, Leanne! Another beautiful dessert recipe for us all! Thanks so much Elaine! That’s very sweet of you to say! Thanks Terri! Avocado, maple syrup and cocoa always make a delightful treat. Hope you get a chance to make it! This is a perfect dessert, light, flavorful and decadent all at the same time. I can’t wait to try it out over the holidays. Thanks Kristen! It’s definitely decadent! Would love to know what you think if you make it over the holidays! These are definitely a show stopper! I love that they’re naturally vegan, so perfect for everyone around the table. Thanks Aryane! It was definitely my goal to make this a dessert that everyone could enjoy! I hope you enjoy it with your organic avocados! These look truly amazing! I don’t see how you restrained yourself from eating that chocolate filling all from the bowl! LOL! So yummy. Love the combination of the creamy chocolate and the tart sweetness of the raspberries. Great recipe, Leanne! Thank you so much Haylie! I really could have sat down and ate the entire bowl of the chocolate filling! I’m looking forward to making this one for an upcoming gathering!